Father Richard Estrada and long time friend Eddie Bautista. On any given night in Boyle Heights in 2010, 1000 youth were homeless, according to a study. Citywide, almost 5,000 youth are sleeping outdoors under freeway ramps, in parks, abandoned-buildings, empty-lots, or nestled in foliage adjacent to the Metro Line or the Los Angeles River. They blend in at bus stops, boulevards or neighborhood streets hanging out aimless because they lack the basic necessities of life. (Some of them are high school students who live in cars or vans without their classmates or teachers’ knowledge.). Their dire circumstances make moving forward an almost insurmountable task. Lacking skills, often depressed, scrounging for food in dumpsters, self-medicating with drugs and alcohol just to make it through the night, they wander among us craving the warmth of human contact; their desire to connect with family is thwarted by obstacles not of their own making. Sometimes they get sucked into gangs. Many left home early to escape physical and mental abuse by callous fathers, uncles or drug addled mothers, or economic factors that undermined family stability. The reasons are as varied as the individuals who are pushed out or decide to leave on their own. The point is not to judge the individual that is in a sink or swim struggle, but to throw them a rope and salvage their humanity—and perhaps reaffirm our own. There are social service, religious and government programs that are charged with this mission. One of these is Jovenes, Inc.
A four building compound located in Boyle Heights on Pleasant Avenue currently serves 84 young men from the ages of 18 to 25. The refuge, called a campus, sits above the interchange of the 5 Freeway to the San Bernardino Freeway, half a block from Cesar E. Chavez Avenue. The focus is placed primarily on males, say Jovenes administrators, because homeless women have greater access to shelters and services than men. As a result, Jovenes, Inc. has opted to take up the slack for young men on the streets. During the 1980s an influx of immigrants, including unaccompanied minors, fleeing the strife of civil war in El Salvador and Guatemala arrived in Los Angeles with no organized effort meet their needs. La Placita Church downtown became a focal point. Without roots in the city the adolescents became street urchins sleeping in front of and around the church, becoming victims of vice—drugs, sniffing gas from plastic containers and prostitution were all observable behaviors. Officers at the Mexican Consulate became concerned and with Catholic Church officials, Clinica Oscar Romero and CARECEN, asked the obvious question: How do we respond to the needs of these youth? Father Richard Estrada was entrusted with the task of finding a solution. Thus, out of an obvious necessity, was Jovenes, Inc. born This was around the time of the Los Angeles Riots, during which a noticeably hostile Anti-immigrant Movement was just beginning to surface politically. From humble beginnings in an Echo Park storefront on Sunset Boulevard, the program did outreach, campaigned for homeless rights and solicited resources to address the needs of homeless youth. An experiment in art project drew out the innate talent of the young men whose works were met, surprisingly, with community appreciation. The vibrant and even violent representations on canvas exposed an angst filled state of mind and an imagination alive with possibility. Consequently, an empty lot in the neighborhood was offered for the initial Jovenes art shows. Using a variety of artistic materials and tools the group gained empathy Another marginalized demographic, transgender youth and LGBT kids (that designation was not yet in vogue with gay youth) were identified and in keeping with their mission, Jovenes, Inc. took them in at a time had the general society had very little knowledge of and a lack of empathy for this emerging community and its challenges. As the program grew, Jovenes, Inc. moved to a bank building on the corner of Broadway at Chavez where they flourished and again had to relocate to satisfy the need for space. 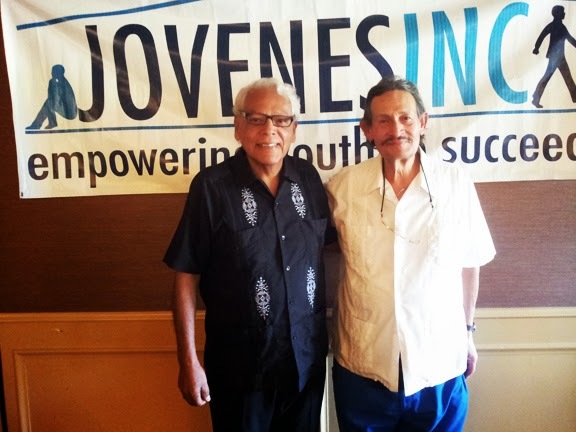 Today, Jovenes, Inc. is established at their main facilities in Boyle Heights where they have resided for two and a half years. “We are in a critical time in the lives of the young men we mentor,” declares Eric Hubbard, associate director, who encourages clients that “Life is all ahead of you, there are still opportunities for success.” Jovenes, Inc., like any meaningful social service provider, succeeds because they see themselves as patrons of a cause. Many of their clients have lived on the streets for two, three and five years. Some have been termed out of foster care at 18. The program, as a transitional housing facility, ingrains basic life skills to prepare a young man for a job interview and eventual independent living. Former clients have achieved the goal, others have returned out of gratitude to become case -workers and model their success for others to follow. In the real world, not every fellow succeeds. A lack of trust and confidence based on years of neglect are difficult to suplant with all the best intentions. Nonetheless, the success rate is very high, thanks to the one on one approach. In the course of a year, Jovenes serves 300 young men, 180 of which have cycled in for shelter, many for up to six months. Earlier this month, Jovenes, Inc. hosted a fundraiser at the Friendly Hills Golf Club in Whittier, where a small group of enthusiastic supporters expressed their intent to help grow the enterprise and assure that many more young men are lifted up into productive roles as contributing members of society. On hand was Executive Director, Andrea Marchetti, to introduce a couple of the non-profit’s clients, a young Latino and a young African-American, who are on their way and grateful for the guidance and inspiration that has taken them to the next step on the road to self-sufficiency. The next goal for Jovenes, Inc. , is to raise $20,000 to create a reserve fund and triple the organization in size. If you wish to contribute or learn more about the program call (323) 260-8035 or email Amarchetti@Jovenesinc.org.